A cute baby Harp Seal waits patiently on the ice for the return of its mother near the Gulf of St. Lawrence in Canada. A baby Harp Seal near the Gulf of St. Lawrence is extremely cute with its beautiful snow white fur and dark black eyes peering at you with a helpless look. 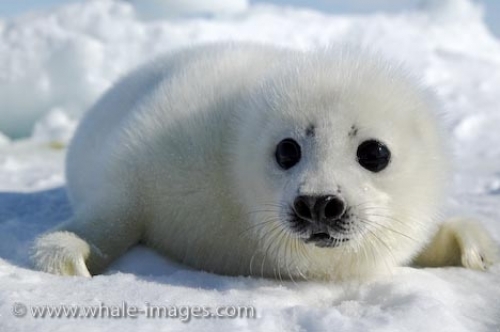 The fur, black nose and eyes help in protecting the seal as it blends in with the snow and ice. The baby Harp Seal sits atop the ice waiting for its mother to return to nurse which lasts approximately twelve days in which time the baby harp seal gains about two kilograms a day. After twelve days, the baby is left to deal with life on its own which includes no weaning process. This is fairly difficult at first as this cute marine mammal cries for awhile, finally calming down so that it can save its energy in order to be able to swim and find its own food when it is nearly a month old. During the time when the seal is left on the ice alone, humans and Polar Bears can be a danger to this cute animal. If the baby Harp Seal makes its through its first year of life, which thirty percent of them do not, their fur changes into a dark grey leather coat. Once they reach adulthood, the Harp Seal is more aware of the dangers and the hunters are not out to kill them as much as they are the babies. There are thousands of baby Harp Seals killed every year and hopefully with the protests which take place, this gruesome act of violence will soon stop. For those who love marine mammals, they do not come much cuter than the babies found on the ice floes during the winter months. The Gulf of St. Lawrence is an exceptional area to be able to view this cute animals in their natural habitat. Baby Harp Seal, Gulf of St. Lawrence.